Exercise or Rest: How to decide. It can sometimes be a challenge to know if we are overdoing it, or conversely, if our reasons for not wanting to exercise are valid. Since most people do not enjoy exercising, it can be easy for our minds to talk us out of exercising by telling us things like: “You need a break, you’ve been working really hard lately.” “You don’t want to do too much otherwise you might hurt yourself.” “You should exercise later after you’re more alert.” Or even, “You don’t want to do too much otherwise you’ll be too tired later.” If you’ve ever found yourself saying any of these things to yourself then you’ll want to dust off your sneakers. Although there may some truth to all of these thoughts above, when it comes to developing the habit of exercise, you should NOT TRUST YOUR FEELINGS! They are unreliable when it comes to determining your desires about exercise. Your mind will always look for the path of least resistance, meaning that it will try to do the least amount of work possible. I always laugh at myself because when I hear myself thinking about ways to put off my workout, I want to believe the lies and act as if they are true, but when that other voice tells me that “I don’t need a second helping” or “I will regret eating that dessert, ” it’s so much easier to ignore that voice. Here’s the truth: While we live in these earthly bodies we will have to understand that when it comes to doing things we don’t want to do, we must ignore our feelings. We are pleasure-seekers which can be a beautiful thing, but we must understand that not everything that is pleasurable is good for us. 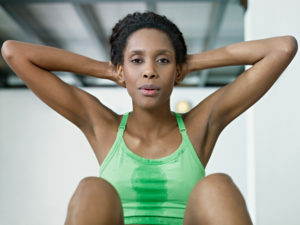 So how do you decide whether you should exercise or not? I pray that these following points will help you to make an informed decision and exercise wisdom in your health and wellness program. What did you commit to? If you committed to exercising 5 days a week and on day 4 you’re telling yourself that three is ‘better than you’ve ever done before, so it’s good enough,’ you should ignore that voice. God does not call us to good enough, He calls us to pursue excellence. Yes, three days is better than none but your goal was four, so you should honour your commitment to yourself. This is an extreme example that is meant to show you that God takes your commitments seriously. It is not meant to scare you. In Acts 5, Ananias and Sapphira honour their commitment to give but they withheld a portion of their proceeds. The consequences were dire! God wants us to honour our commitments. Although the consequences of shortchanging yourself is not death, it has long-term implications on your confidence, your self-discipline and your belief in your own abilities. Are you in pain or experiencing any discomfort? It’s natural to experience muscle soreness after exercise. It’s a good sign that you are strengthening your muscles. However, we need to exercise wisdom when deciding whether to take a break or not. Sometimes it’s good to work through soreness, it will help you to recover faster and relieve the soreness so don’t let that be a reason why you bail on your workout. If you’re sure there is no injury or pain, push through a bit of muscle soreness, tiredness or even stiffness. How will you feel after? Starting your routine is always the hardest part. Once we start, we can usually stick it out and even wonder why we don’t do it more often because it feels so good. If you’re feeling tired, you feel like you’re too busy to make the time, or you just can’t seem to get yourself motivated to start, ask yourself how you will feel after. Tell yourself you’re only going to do 5 minutes and when your endorphins start flowing, chances are you’ll keep going after the 5 minutes are up. Look at your track record. Do you have a habit of talking yourself out of your workouts. If cancelling on yourself is rare and you know that bailing on your workout is more of an exception than a rule, then don’t sweat it, one missed workout won’t derail you so cut yourself some slack. But if you’re constantly making excuses and justifying why today is not a good day to exercise, then you should absolutely ignore your feelings. They’ve let you down in the past and will continue to let your down. The best predictor of your future success is your past behaviour so use your past history as your gauge.